Simchat Torah, October 12th, was an incredibly hot "chamsin" day. Suddenly, without almost any warning, police loudspeakers were heard telling residents of this jewel-like village to evacuate immediately as a flash fire began to consume this artistic village. 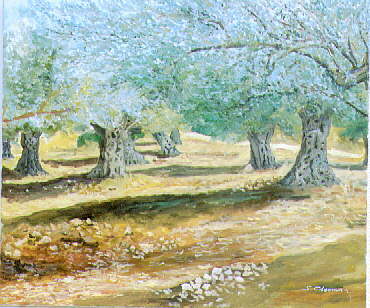 Kibbutzim nearby took in many residents from both the neighbouring villages of Ein Hod and Nir Ezion. Worse was to come the following day. After residents had believed that the fire was under control, it once again burst out, started by the freak accident of a car in the Arab village nearby, bursting into flames. The second day caused the most damage and the destruction of 15 homes. Many artists lost all their possessions and their art. "I would never have believed the ferocity of fire if I had not seen it myself. A wind that changed direction constantly encouraged the great walls of flames to find any opening where there were tunnels of air created between the hillsides. The pines trees burst into flames simply from the heat. Today in the aftermath of the fire, the black hillsides await clearing, replanting, and many years of growth in order to make the landscape green again." In order to help artists who lost everything, to fund rehabilitation of the village and its surroundings, several auctions are being arranged: artists from other cities are coming to the aid of Ein Hod, and Ein Hod itself is organizing an auction of the work of its own artists. In addition to the help of the Jewish National Fund, we need funding for big trees. Terraces need to be constructed in order to stop erosion and landslides. Residents who were not insured, need help. It is a very sobering time for this village which was founded in 1953 by Marcel Janco, a Dada artist who had survived World War II in Europe. Despite the trauma and setbacks, Ein Hod continues to show a wide variety of works by all its artists. The main gallery - the Janco Dada museum is open, and studios around the village offer a variety of pottery, glassblowing, stained glass, lithography, fine art photography, exclusive handprinted fashionwear and more. Visits for groups of all ages can be arranged as well as workshops and lectures. 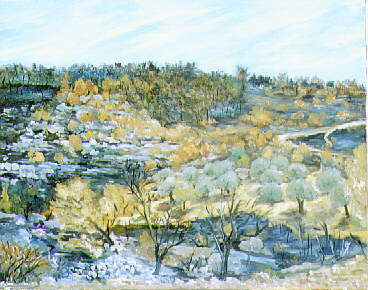 Below one of the artists painted a section of the forest of Ein Harod before the fire and what it looks like now after the fire. We would appreciate any help that would enable us to rise from the ashes.